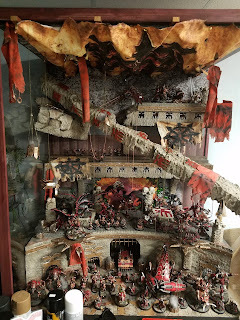 Wow it has been a long time since I've posted on the blog. I check it daily to see my blogroll and check out everyone else's sites but I just haven't taken the time to put in work on mine. My wife just recently took up a side gig to help coordinate social media for her mom's workout group. Watching her put the time into generating content made me realize much work it is to stay relevant in the constant barrage of media we consume on a daily base. 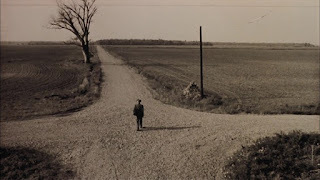 I'm at a bit of a crossroads in my hobby space, mainly to do with the balance of family time. I really can't dedicate the weekend time for gaming, I want to get as much time in with the kids and helping out around the house. 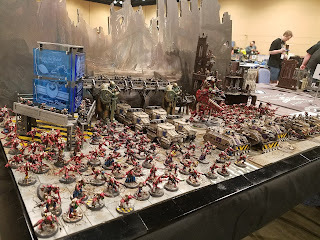 Sadly, my last game was Adepticon, and I may only get some games in a few times a year. But my mind doesn't stop obsessing! I'm always thinking of new paint schemes, fun armies to work on. 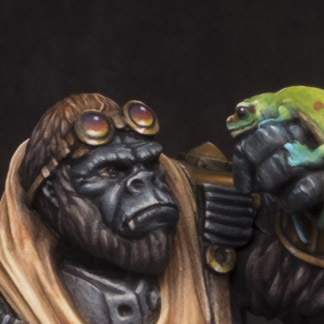 It doesn't help that GW's rapid release schedule has so many temptations. We just moved into a new house and although it is bigger, it doesn't have a finished basement yet, meaning I don't have a dedicated hobby space. I decided to take half of my home office for at least a table to paint on, so that's working for the time being. I've been getting a few nights here and there to put some paint on models. I just don't get those marathon 4+ hour paint sessions anymore. The big situation is the ridiculous amount of hobby stuff I have. Massive amounts of miniatures still in boxes, tons of terrain, game systems I haven't even touched. Years of years of planned projects I won't tackle, and lots of armies I've painted but are collecting dust. I guess I'm realizing now I need to pair down. My dreams of a huge gaming area with multiple tables for tournaments at my house aren't going to happen. I won't be traveling to tournaments anymore. This isn't that big of a deal, just a shift in priorities. I just have changed over the last 10 years from being single, to married to having a family. Time is the constrained resource. Now what do I with all the stuff I have? I really would like to extract some value from it, but I don't want to spend a ton of time cataloging, photographing and selling it. I really do go back to my huge amounts of bits bins and scrap piles to work on projects, but honestly would it be so bad if I cleaned out space and just had to re-purchase from time to time? I guess I need a professional hobby organizer. With that said, here are my active projects and ones I would like to tackle. 2. Guard CP Battery. Yup, all the cool kids are doing it, but I really need it for knights. 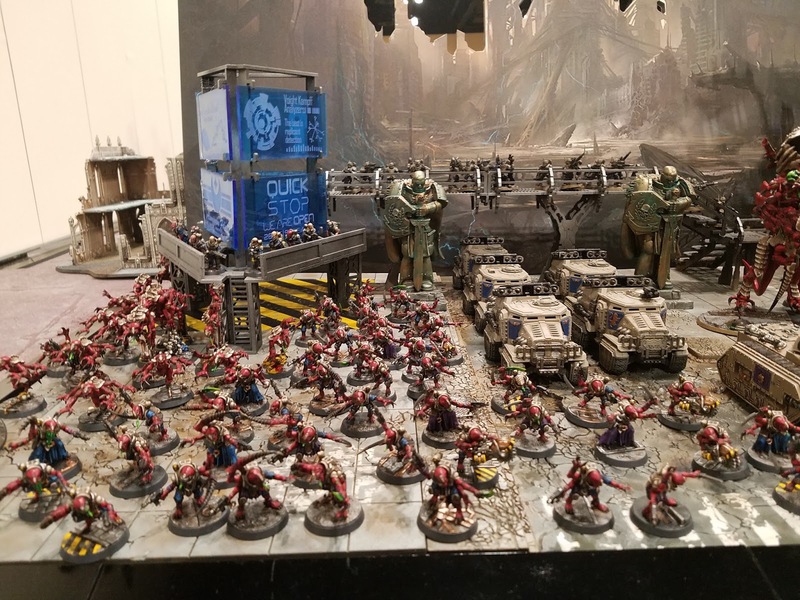 Almost done painting 35 guardsmen. 3. Tau. I want to add some fun toys and try a couple one-trick pony lists for Tau. Some goofy stuff that will probably win big / lose big. All I need to paint is a few suit commanders, a few cadre fireblades, and a couple big flyers. 4. MFSM. For those of you that go way back with me in the GW community, I want to tackle the "Most-Friendly" Sea Monsters, the Idoneth Deepkin. My daughter will love the models and I think they'd be fun to paint. I really want to give Age of Sigmar a try, and the sky dwarfs were taking way too long to paint. 5. Basement remodel and gaming space. This will be done this winter. I want to make a dedicated gaming room with a door to keep little hands away. 6. Infinity. Maybe this will finally be the year I paint some up. 8. 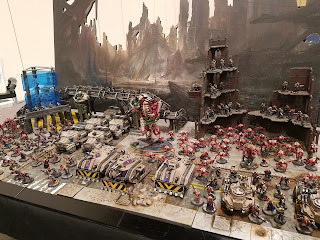 Necromunda, Killteam, Adeptus Titanicus: yeah I want to do them all. 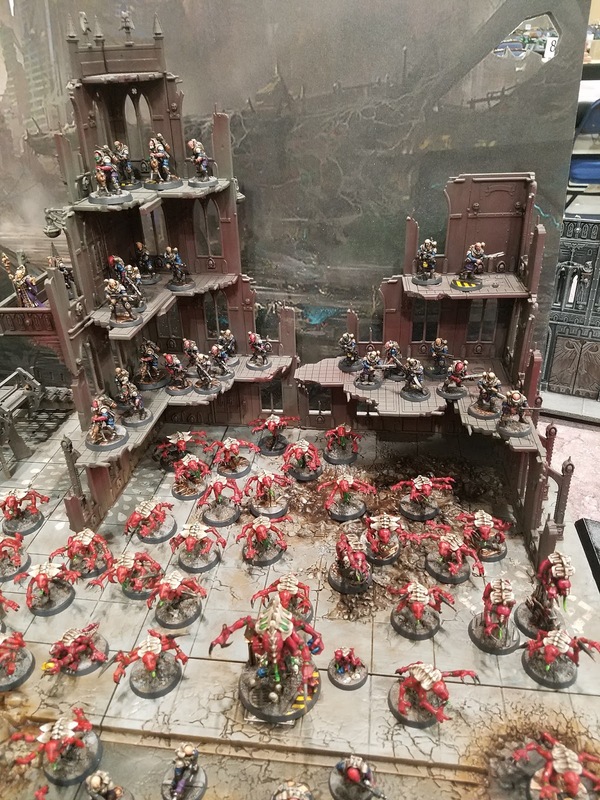 Delaque when they come out, cool terrain for Killteam, and a beautiful board and some models for AT. Now I just need to figure out how to get rid of all my extra armies and the tons of box sets and terrain I have collecting space. My wife will be much happier if I make the move. Now that I've detoxed from Adepticon for awhile I have been dabbling in a little painting. I'm debating on what my next projects will be. Here's my "short" list. The reason I'm prioritizing is we have kid #2 on the way in October. Plus I'm doing more and more with my SCA rapier combat study so it's the long debate on time spent! 1. Work on a gaming table. My dad does fine woodworking and will help me make a sweet one. I've been looking around pintrest trying to get ideas. 2. Figuring out how to use weathering powders. I really want to learn how to make things look dirty and not just factory fresh. 3. Improving my airbrush skills. I started last summer, I'd like to try and put some more time into it. 4. Make terrain. 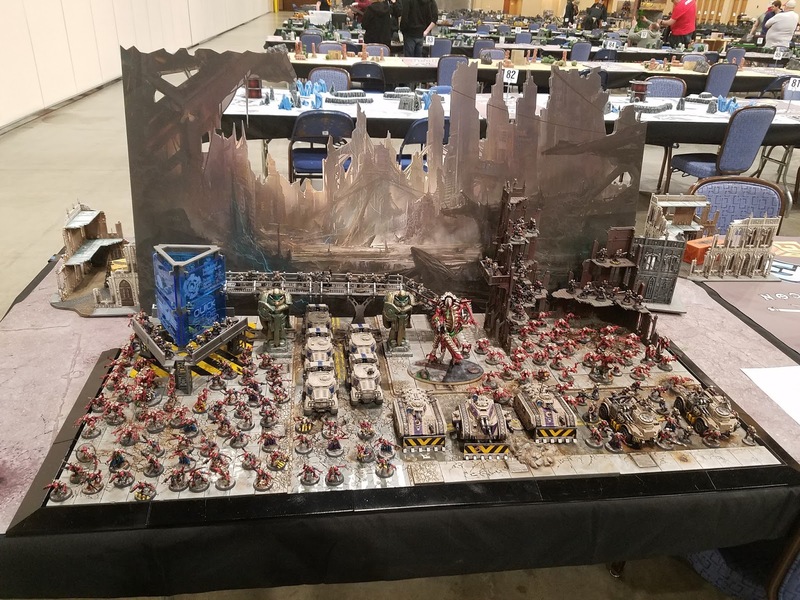 40k, infinity, wild west, etc. 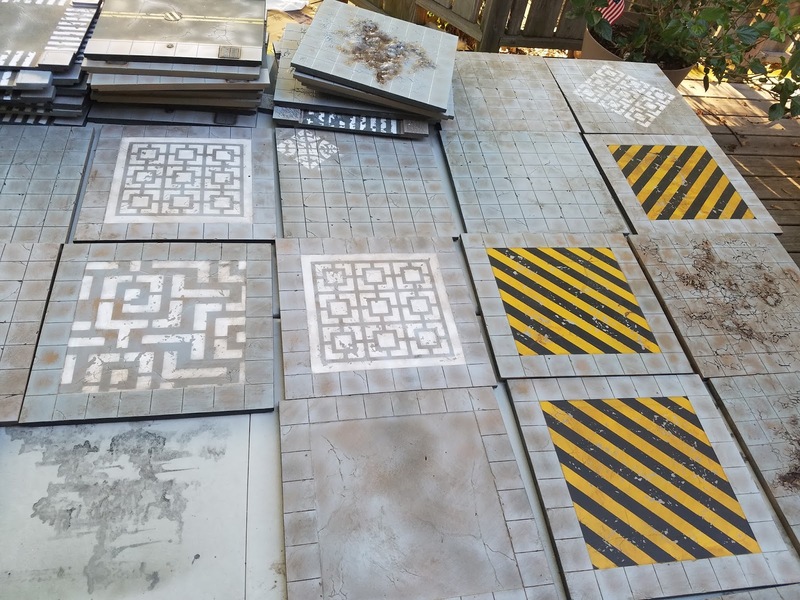 I'd like to have a good catalog of finished terrain. I own all that I need just need to spend time on not working on armies. 4. Maybe, just maybe I'll actually work on the Death Korps of Krieg. 2. Wild West Exodus: I have the Golden Army, Union, Lawmen and Holy Order... I started really working on Union but I think the Golden army or the Holy Order would be a lot of fun to paint. 3. 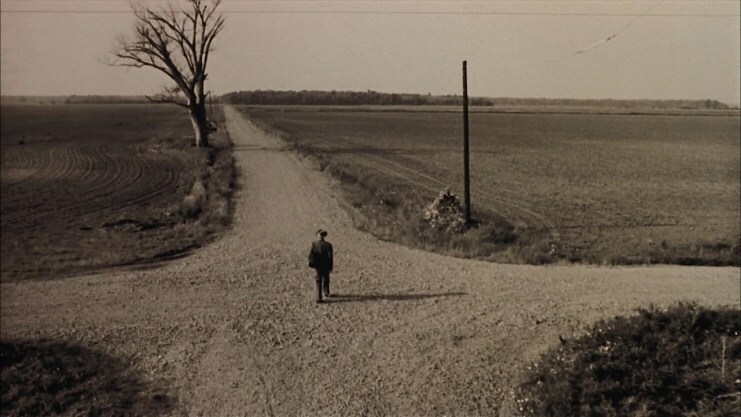 Devils Run Route 666. I picked up a bunch of stuff on their first kickstarter. 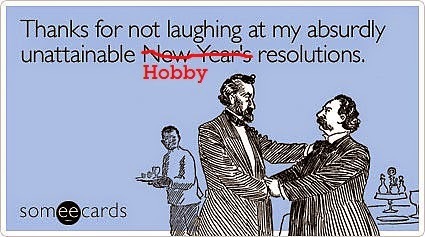 I really need to learn Hobby goal #2 before I spend some serious time on them. I need to have a serious session with my camera. I'll post up all the detailed shots of the cult. 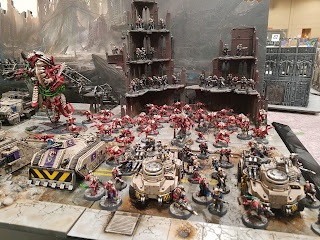 In the meantime, here was my 40k championship army and our team tournament army (I did the non cult stuff). We were lucky enough to play on the twich channel Warhammer TV Saturday night for the team tournament! These were shots from my phone... sorry for the focus/resolution! 2016 has come to a close and I'm already tearing through 2017. It was an interesting year, and I didn't tackle as many of the projects I was hoping to as I was busy in other hobbies (sword fighting), and balanced the work and family life. I also put some major time into renovation of my house but at least now I have an awesome screen room ready for the spring when the weather gets nice. Here are some of the hobby things I did do in 2016. 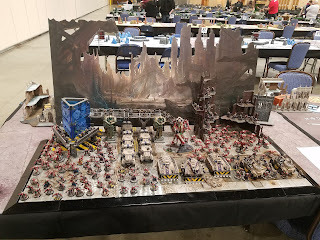 It started out as our team tournament army for adepticon. I then added a bunch of big monsters for the hellforged hunting pack. I owe some nice shots of the army up on the blog, that something I'll do over the next few weeks. 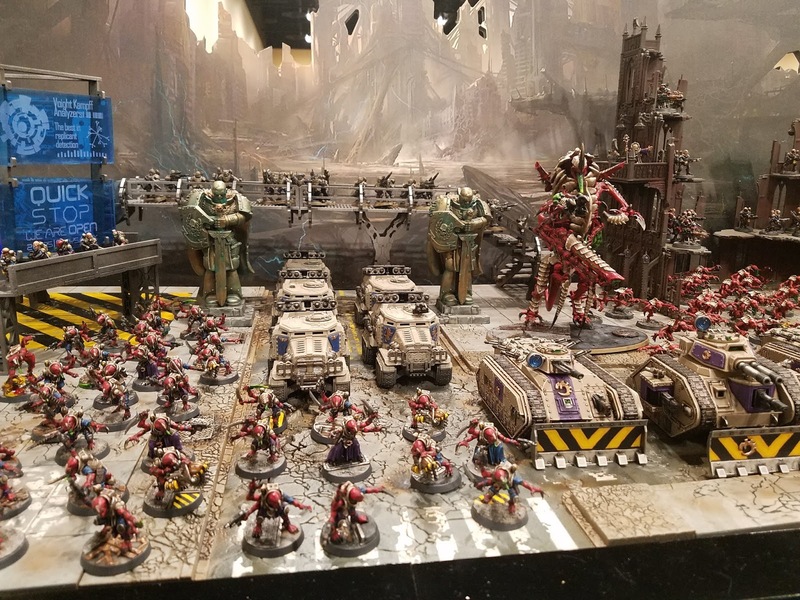 I added 20 or so necron models to my force; a bunch of lychguard, stalkers, and characters. 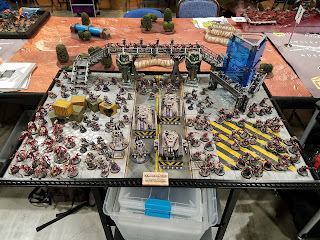 I just feel dirty every time I play necrons! 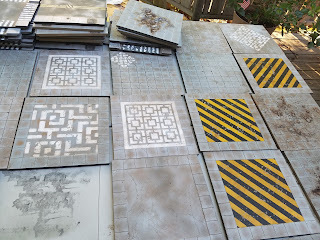 I finally got over my fear of the airbrush and started working with terrain, especially the tablescapes tiles. I also played around with how to use oil washes. I haven't gotten as far as using them on miniatures, but for terrain it was a great way to add some shading. In the end, I finished about 80 to 90% of the work. I just need to add some finishing touches and learn how to weather. Now for the resolutions for 2017! This army seems to be taking forever to paint, and it doesn't help that it has a ton of models. I'll be playing this for the Adepticon team tournament in 2017 as well as it'll be my go-to army for awhile. I'll need to bust out some terrain for it as well. I'd like to have a force for 30k, and the banana marines will be my army. Should be fun to paint up a clean "standard" force. I keep saying I want to get into infinity. 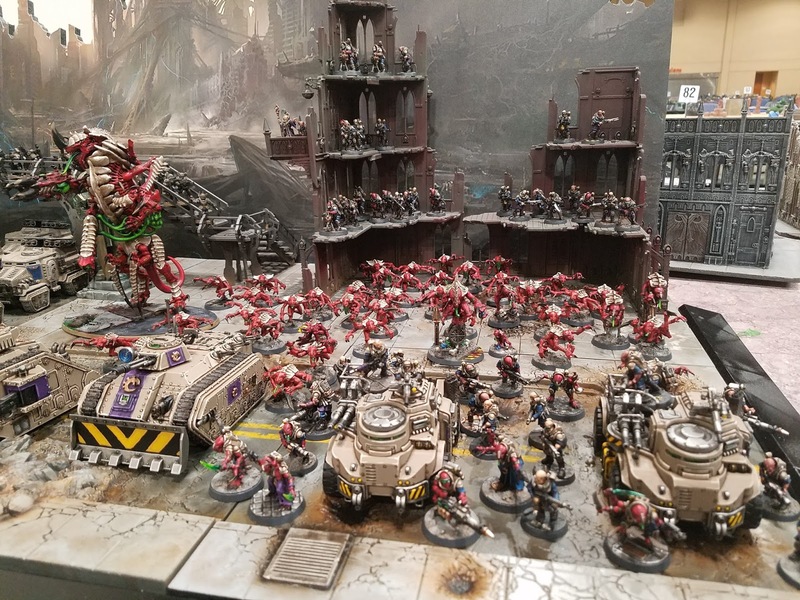 I'm going to try and put a damper on all the crazy 40k armies that keep coming out that will distract me and try and put some time into this game. I really started tackling this at the end of the year and made a ton of progress. I'd like to sell a bunch of the stuff that is collecting dust and taking up space and organize the rest. I'm fortunate enough that my father is an excellent craftsman and can help me design a functional and beautiful gaming table. I've always wanted one and I think now is the time. 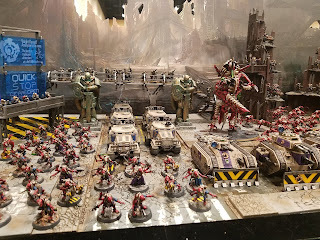 This really goes hand in hand with #6, to have some beautiful terrain not only for Infinity but 40k. I'd like to have at least 2 or 3 themed tables for infinity and at least 3 to 4 tables worth of 40k terrain. That way I can host some gaming days at my place. In addition to learning how to improve the airbrush, I've also been afraid of working with weathering powders. This needs to get tackled this year. I'd like to at least start an age of sigmar army for some relaxed play. Either I'll use some of the Khorne models I've already created to flush that out, or I'll try some models I already have (Bretonnian or Chaos). If I really get aggressive, I've always wanted to do a night goblin army with tons of squigs. So there we have it! 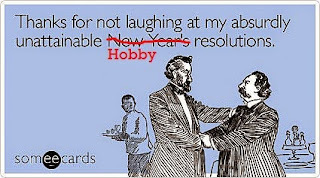 If I could actually knock out half of my resolutions for 2017 I think it will be a pretty successful hobby year. 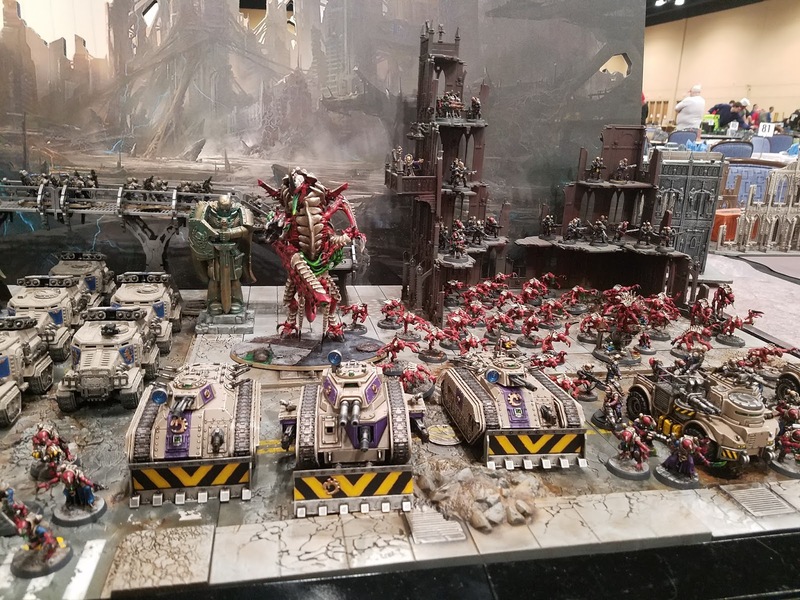 I just had the great opportunity to talk with Dawn from Beasts of War to chat about the 40k Friendly and 40k Team Tournament at Adepticon. Check it out! Now after just watching Rogue One, I need to resist the urge to buy tons of X-wing miniatures and get back to painting up Genestealer Cult. Only three months to Adepticon! I'm a total sucker for tokens. 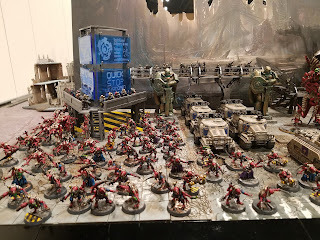 You can see what I've done for other armies before in the tags. I find that it helps so much in gameplay both in not forgetting things myself, but letting my opponent know what is going on. There is nothing worse then feeling like someone is pulling a fast one on you, or the reverse... completely forgetting important bonuses. I created a set of tokens for the Genestealer Cult since there is so much going on. Here's a picture of the finished product! To make it easy, here is the list of things you'll need. I left Amazon links for the product you'll need. I created a sheet of tokens that are a little wider then 1 inch. That way you have some play in where you punch the circles. I then punched out all the circles. Apply some mod podge glue to the back of the token and glued the face of the token to the bottom of the glass. After letting it dry, I simply added the felt circles to the bottom. Easy as that. Now I have nice looking tokens in a bin to break out in the games. 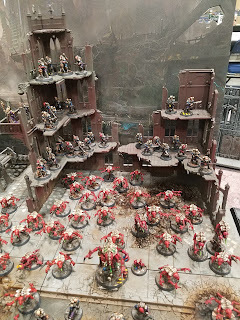 Hopefully tomorrow I'm going to get my first practice game in with the Genestealer Cult. There will be some proxy, but I hope to have a good chunk of actual models on the table.